Lee Johnson believes he will benefit greatly from the lessons learned during his first full season in management. At 32, the Oldham boss is the youngest manager in the Football League. 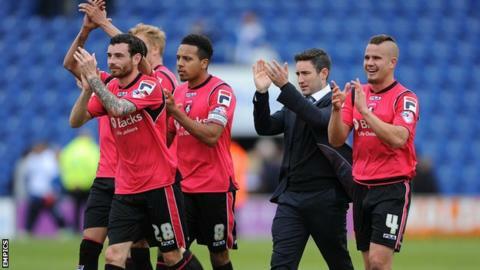 A nine-match unbeaten run in the closing weeks of the season has seen the Latics secure safety in League One. "Some of the hurdles we've had to leap this year have been enormous. It can only bode well for myself to have had that experience," Johnson told BBC Radio Manchester. Former Yeovil and Bristol City midfielder Johnson replaced Paul Dickov at Boundary Park in March 2013 and guided Oldham to safety during his first two months in charge. They were in danger of being dragged into another relegation battle in 2013-14 but have won four and drawn five of their last nine outings to climb to 15th. And they could still finish in the top half of the table if they beat Notts County on Saturday and other results go in their favour. Reflecting on the season, Johnson said: "It's been one of pride, frustration, lessons learned, hope and the desire to push on. "We've needed a good run and we've played some good football. "If we can add that little bit of quality in the summer and trim the fat, hopefully we can progress again. "It could be a slightly easier division next year considering the teams that are coming up and down."